Paper Mache Christmas Treat Bowl – Great Gift Idea! Balloon – You will need one for each globe. Pick a bright color. It will help you later. Shredded paper. – While newspaper works well, if you have old white paper I recommend using it. It makes it easier to paint with less coats. Twine or String – You will need about a foot and a half. You will also need another foot in addition separated. Paint – You will need Red. Start by mixing Flour and Water to make a paste – I recommend using a wire wisk to get out any lumps in the mixture. Blow up your balloon – Pick the size you want your globe to be and blow up your balloon. Tie your twine to the top of your balloon. – You will need to hang it to dry later. Dip Strips in glue flour mixture and wipe off excess – The paper strips only need to be moistened. Start with a single strip around the spot you want to be the top of your bowl. – This will give you a reference point and keep things mostly smooth. Stick to balloon and smooth out. – Make sure to have your child rub the strip down so that it doesn’t have any lumps. Lumps now will set that way as it dries. 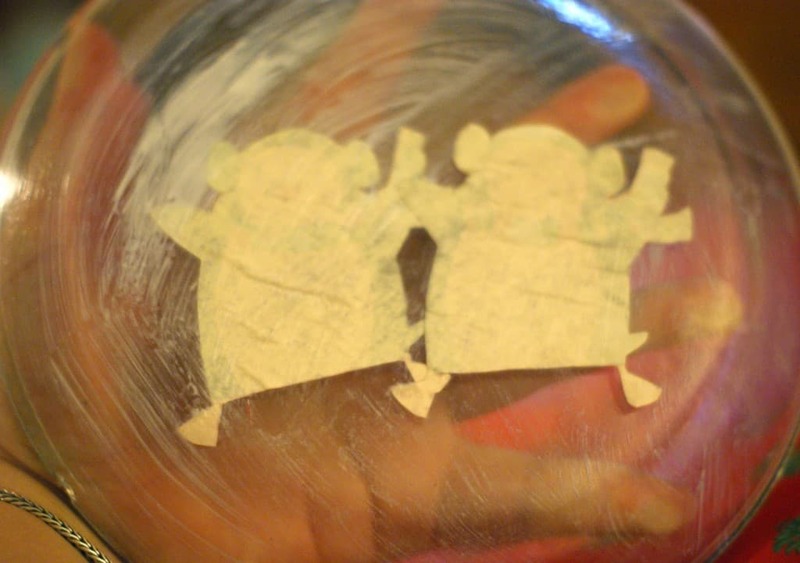 Check for holes and patch them – Holes in the paper will dry as actual holes in your globe. Have your child make sure to check for spots that aren’t covered. This is where having a bright colored balloon comes in handy. You don’t know how hard it was to find holes on the white one. Pop Balloon – Use a needle and pop your balloon. Paint. – It may take up to 3 coats to get a nice dark red without the newspaper showing. 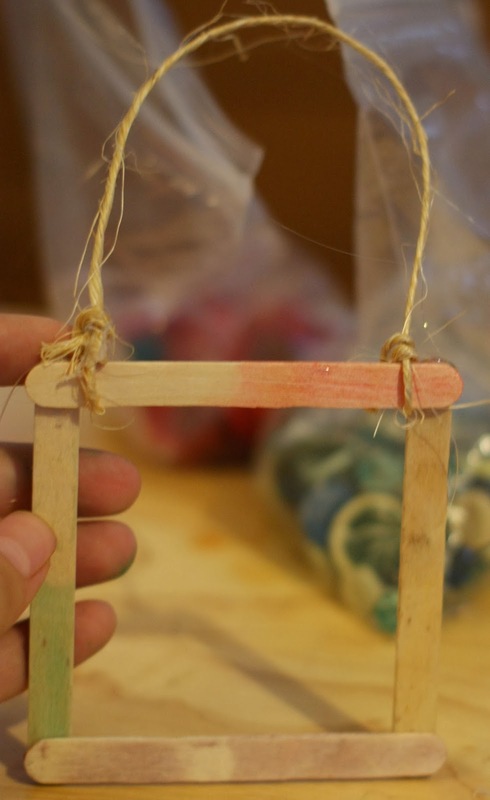 Use a hot glue gun to attach your twine to the outside. – I recommend going around it with twine. Then cut the twine and tie a bow. Glue the bow on after. Add a coat of Mod Podge – This will seal your bowl and keep the bugs out of it. Let dry for 24 hours. Fill with treats and share or enjoy. Did you try this project? Share yours with me on Facebook, Twitter – @morthancoupquen, or Instagram. While I was out at the thrift store this week I grabbed a few glass plates for only fifty cents. I decided that they would make great cookie plates for Christmas cookies this year. 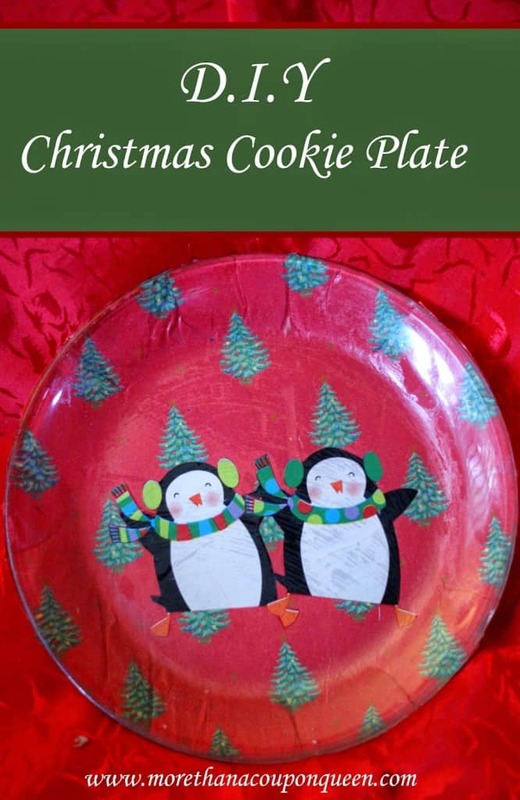 This Christmas Cookie Plate would be perfect as a gift to go with Christmas cookies for a friend. Clear glass plate – I highly recommend visiting the thrift store because I found mine for fifty cents each. Wrapping paper – You can pick any design you want for your plate. I chose one that had penguins and another with trees as a background. Dishwasher Safe Mod Podge – This is a must if you want to be able to wash and reuse your plate without it being damaged. Paint Brush – I prefer foam brushes personally but you can use what you have on hand as well. Gold Sharpie – (Optional) This is really optional. If you want to put the family name on your plate you will want this. Clean your plate. – Make sure to clean and dry your plate. Add any writing to your plate on the back. Cover the back of your plate with mod podge. Cut out your shapes for your plate. Place them face down on the plate. 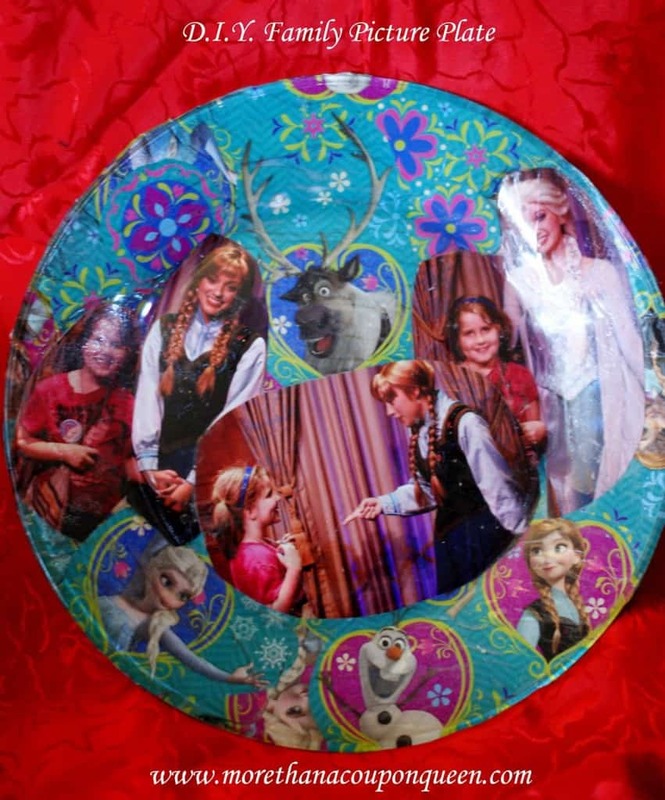 Coat the plate with mod podge again. – Make sure to go over the paper portion as well. Cut out a large square of your background paper. – I find that having about 3 inches bigger than the plate is best. Put the square on the back of the plate. – Make sure to smooth it from the middle out. It may wrinkle a bit. Just fold the wrinkle and keep smoothing. 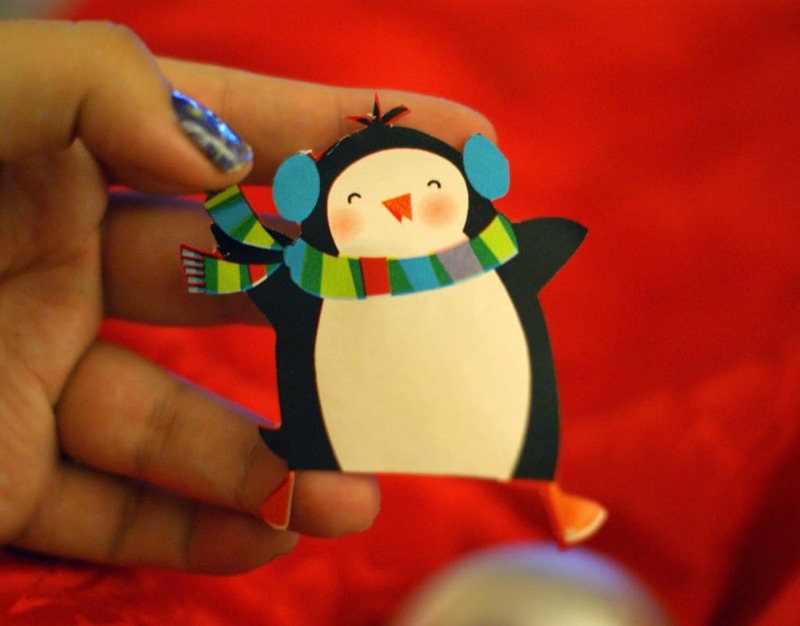 Use scissors to cut off excess paper. Put on a final coat of mod podge. You can also do this with pictures from a trip or special moment. Keep in mind that the pictures will not bend well. You will either have to cut them or fit what you can on the flat portion of your plate. Did you try this project? How did yours come out? Find some great cookie recipes to put on your plate. This year R really wanted to make her own gifts to give at Christmas. 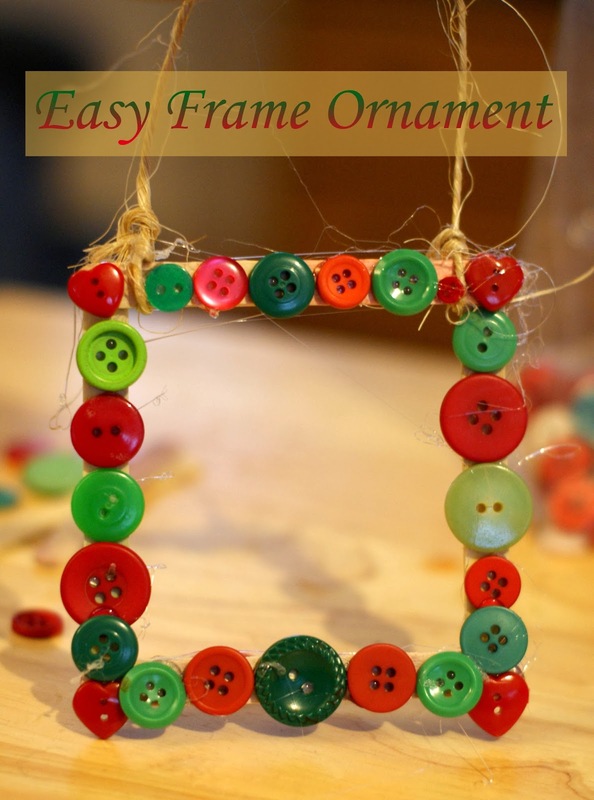 She had an idea for these frames and I think that she did a really great job on this easy Christmas ornament. Yes, our popcicle sticks were used. We cleaned them first. Tie your Twine so it will hang. I like to put a dab of hot glue in between the knot before pulling it tight. It holds your knot more securely. Add your buttons. R designed hers with red and green but the possibilities are endless! Add a picture. Because these are gifts R asked me not to let you see the ones with pictures in them. 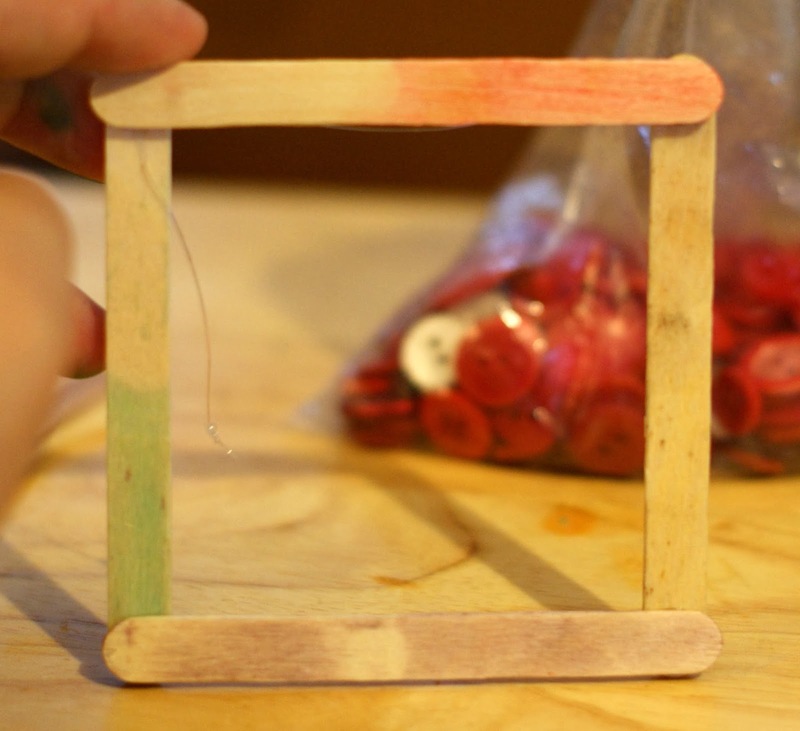 You can tape or hot glue the picture to the back of the frame. 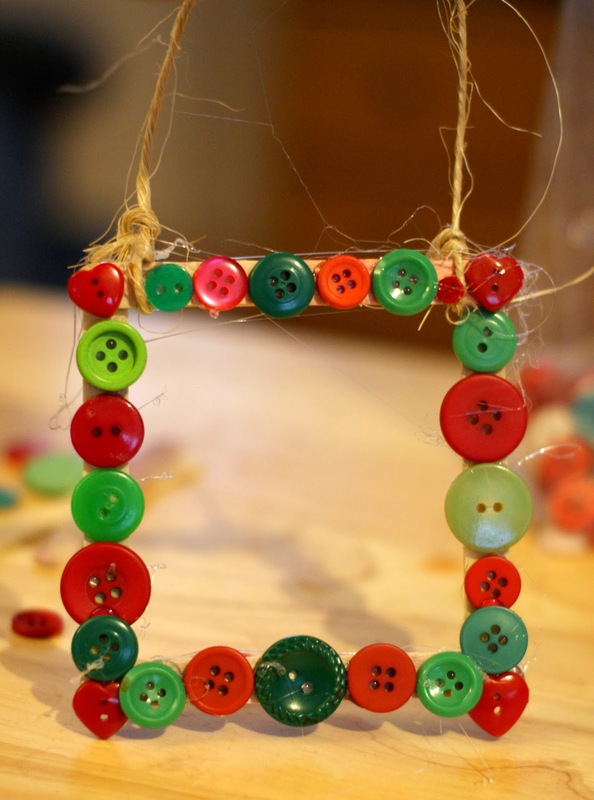 This is a great low cost craft that can be enjoyed year after year.